With a Web forward, you direct a domain or subdomain to another domain or subdomain. It's exactly the same as creating a Redirect, other than that with a Web forward you can also forward to and from a subdomain. If you want to direct (or point) a domain to an IP address, you need to create an A record instead. Under create new record, click Web forward. - Hostname: leave it empty to redirect the domain, or enter a subdomain. - URL: Enter the URL you want to direct to, including "https://". 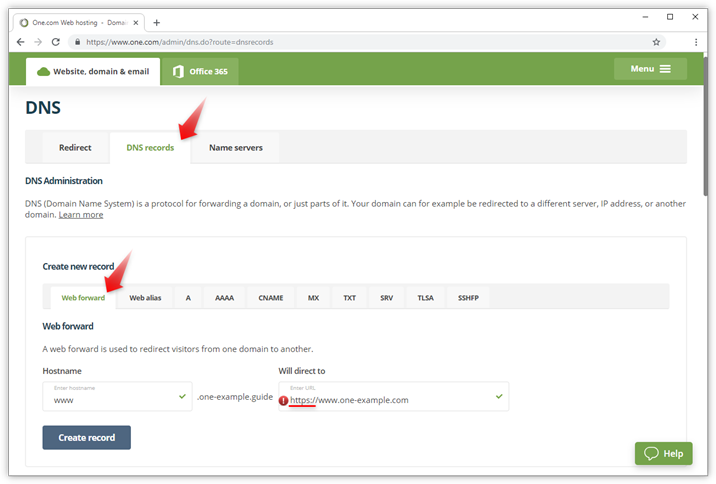 Example: In the screenshot below we have pointed www.one-example.guide to the URL https://www.one-example.com. So when a visitor types in www.one-example.guide in their browser, they en up on www.one-example.com.